Tag! It used to be a simple child’s game. I could write a whole post about how this little word has evolved over the years, but I need to get with the program. All the hullabaloo with the release of my new book, SECRET OF HAUNTED BOG, on June 15th, Heather Kelly’s interview of me on her blog June 17th, and then a short getaway trip with my mom made me put the game on hold. I feel like a slow-poke slacker. Now it’s time to catch up. D.U. Okonkwo of D.U.O. Says... is a new blogger buddy of mine, and I think it’s cool that he reached all the way across the Pond and tagged me. He’s got some good things happening as far as his writing journey, so you might want to check out his blog. Maybe to an 80-year-old man with bad eyesight. Saturday at my daughter’s baby shower. The coins in the photo reminded me that I lost some loot in Laughlin, Nevada on a trip with my mom this past week. We took the seniors bus and had some quality time together even though we didn’t win any jackpots. Skinny Lynnie (no longer applies, though), One Can (as a teen! ), Slim, which no longer applies either, Mommykins (by my oldest daughter), and I’ve recently become Grammy. I know, I know, it’s not really a nickname, but it’s the best name so I had to throw it in. Wen Baragrey at On Words and Upwards because she’s such a trooper dealing with all the earthquakes and aftershocks in New Zealand, lost her mother this past week, and has a seriously ill grandbaby who had a close call with death himself a week ago, but she’s got a great sense of humor and a unique voice. If you have any words of encouragement for this stoic lady, please stop in at her blog. Annie at Hobo Annie Rambles because she’s focusing on increasing her blog following, she’s witty, fun, and interesting, and is a terrific writer, so go show her some love! Tommy at Smells Like Library because he’s a school librarian, is a published author and illustrator of comics and graphic novels, and in my opinion, he’s basically a creative genius. Alana at Writercize because she has some really cool writing exercises on her blog. Pop on over and beef up your writer’s biceps! The Golden Eagle at The Eagle’s Aerial Perspective because she’s a super-talented teenager. This girl is going places, and right now she’s soaring through the blogosphere. Stop by her blog and you’ll be as impressed as I am. So, did you like to play “Tag” as a kid? If so, what was your favorite version? I think Marco Polo was my favorite variety of Tag, especially the part where we’d yell, “Fish out of water” and nail someone! Awww, I think you're hotter than THAT! I like seeing everyone's wallpaper. Thank you for tagging me! :)I love the pirate-style wallpaper; very cool! I'm glad you like the wallpaper, Theresa and Golden Eagle. Looking forward to reading your answers, Golden Eagle! Wow, Heather, that "wall ball" or red @#$ game is something else! Reminds me of "Hide the Belt" that the older kids on our street played when I was about six. It was only for the Big Boys, and someone would hide the belt and whoever found it would whack the others with it until they made it back to the "safe" zone! Crazy! Love it, great answers, and love the pic! I love that picture! 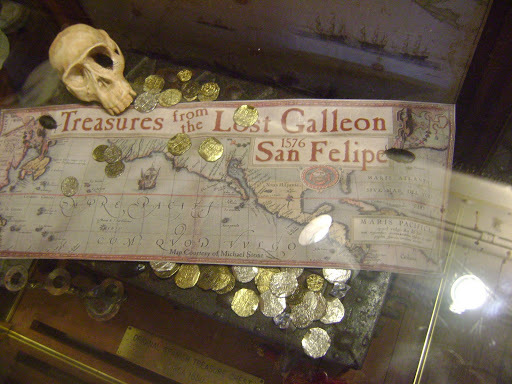 The skull and the coins and the treasure map – ah, makes me want to write a pirate story meself. 🙂 I've passed on an award to you on my blog as a big thank you for dropping by so often and leaving comments! Thanks, DUO, for tagging me! Margo – Yes, it's fun writing pirate stories! Thank you for the award!